I rather like mint sauce, mint jelly and anything else of a minty persuasion (except mint-flavoured toothpaste – I can’t stand that totally fake chemical taste). So I was rather pleased, as you can imagine, when I came across an entry for ‘Mint Sauce’ in Mrs Beeton’s glorious tome. At this time of year, when spring is gliding choppily towards summer, fresh flavours and scents serve to remind us that heavenly fine days and drawn-out summer nights are peeking at us from just around the corner. INGREDIENTS – 4 dessertspoonfuls of chopped mint, 2 dessertspoonfuls of pounded white sugar, 1/4 pint of vinegar. Really, this is more of a mint vinegar than a mint sauce (distinguishable from her separate entry ‘Mint Vinegar’ only by the sugar content). 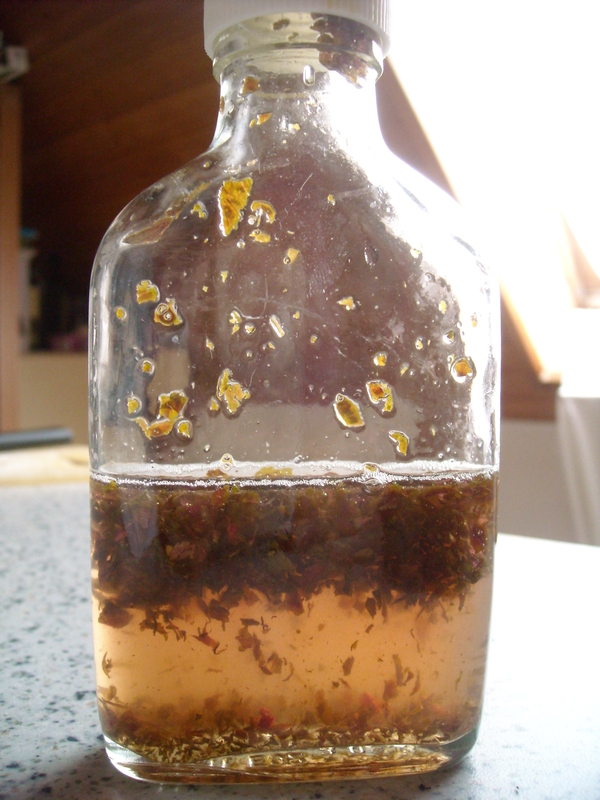 But the great thing is being able to control the quality and flavour by the type of vinegar used. For this recipe, I used some delicious organic white balsamic vinegar that I normally keep for salad dressings. I quartered the quantities for this trial – the mint plant on our balcony is only just beginning to recover from the long winter and it’ll take a few more weeks before it begins bursting into a cheery green overflow of sprigs. 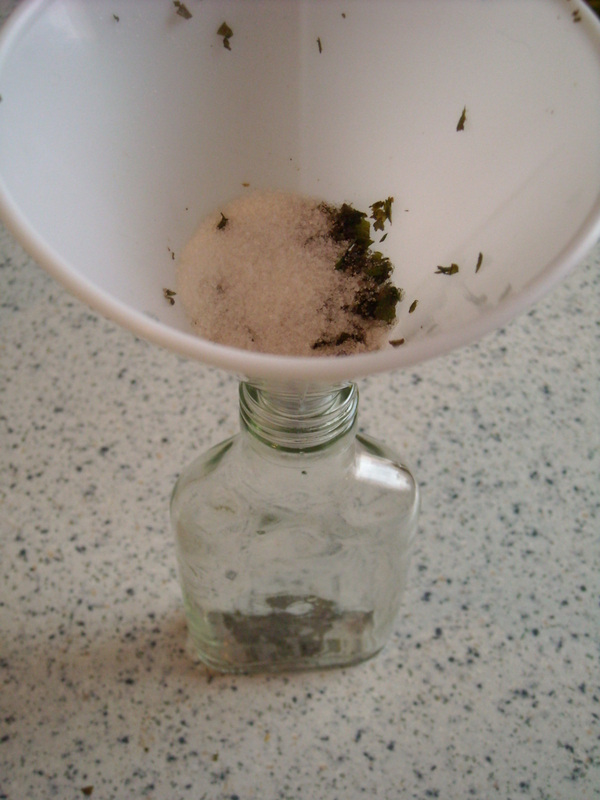 To make things less messy, I used a funnel to direct the ingredients into a small bottle. The directions call for everything to be “put… into a tureen” and stirred. ‘But… to heat or not to heat?’ I wondered, scanning the instructions for clues. But as she makes no mention of the stove, I figured it was safe to assume that the sugar would dissolve on its own in the room-temperature vinegar. I guessed correctly. “What’s that?” enquired my boyfriend as he stumbled into the kitchen to seek out some hot coffee and peered over my shoulder. The answer to this, I proudly informed him, is that it contained no food colouring. I still clearly recall the lightning zap of shock that ran through me when one day, a few years ago, I happened to scan the ingredients of my favourite UK brand of mint sauce, only to discover that the green was the product of dye, not mint. From that moment on, I’ve refused to eat store-bought mint jelly or sauce (and, as I’ve never had the opportunity to try it freshly made, it’s been a long while since I’ve savoured the taste of this marvellous concoction). I found that the longer I left it, the more infused and darker the sauce became (12 hours later, it was very nearly completely brown). The fresh, sweet tang of this sauce on some hot baby potatoes at lunch-time took me very pleasantly by surprise, especially when dabbed in a splodge of butter. I’m pretty sure that the way this sauce turns out depends very much on the type of vinegar used. The white balsamic vinegar works very, very well indeed. 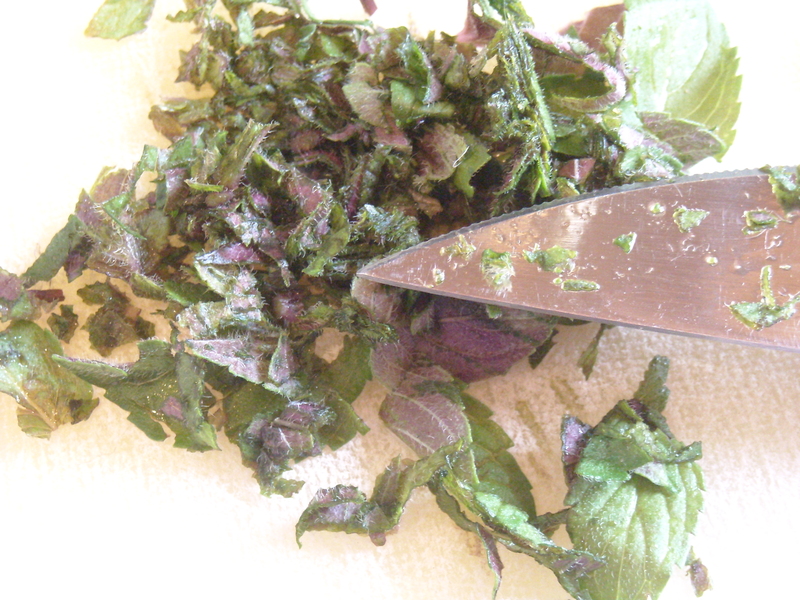 Never – I repeat never – will I consume even a drop of store-bought mint sauce again! 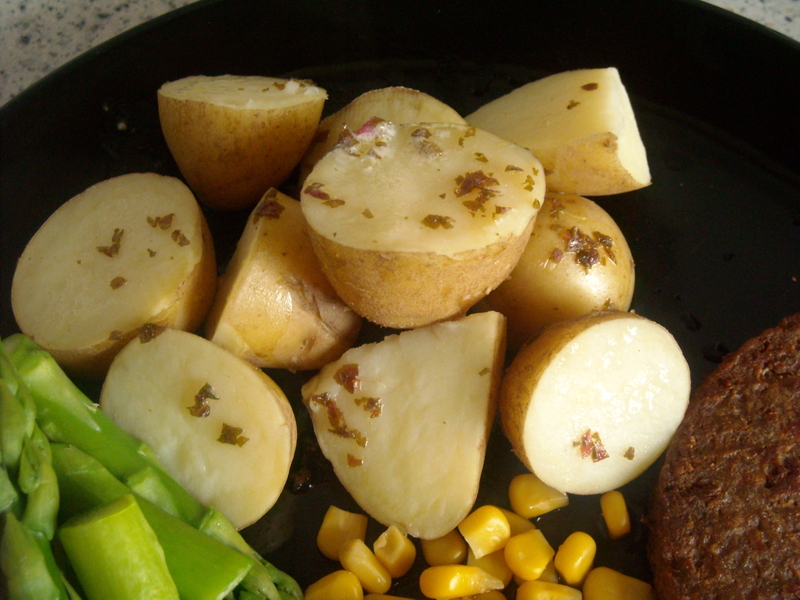 This entry was posted on May 14, 2010 at 2:41 am and is filed under food. You can follow any responses to this entry through the RSS 2.0 feed. You can leave a response, or trackback from your own site.